Campus: Bohai Rd, Panlong Qu, Kunming Shi, Yunnan-650000, P R China. Southwest Forestry University (SWFU) is located in the northeast of Kunming City in Yunnan Province of China. SWFU is the only independent and multidisciplinary forestry university in the western region of China. Currently, SWFU offers Bachelor’s degree programs, Master’s degree program and PhD program in various majors and also non-degree Chinese language programs. The campus of Southwest Forestry University covers 176.13 hm2 in area, with 396,000m2 square meters of construction. 2 Campus The campus of Southwest Forestry University covers 176.13 hm2 in area, with 396,000m2 square meters of construction. There are 1,143 staff members, including 889 teaching staff among which about 392 are full professors and associate professors. More than 400 hold senior academic title, 40 teachers are national, provincial, technology and discipline program leaders. SWFU is the largest forestry University located in the Southwestern part of China. Address: Bohai Rd, Panlong Qu, Kunming Shi, Yunnan-650000, P R China. SWFU is going to increase further the intensity of open education, and devote time and effort to reach the target of building the institution as a regional top university. SWFU seeks to make more contribution to implementing the ‘One Belt and One Road’ development strategy, and to the building of the ecological civilization vanguard. The campus of Southwest Forestry University covers 176.13 hm2 in area, with 396,000m2 square meters of construction. 2 Campus The campus of Southwest Forestry University covers 176.13 hm2 in area, with 396,000m2 square meters of construction. SWFU has established communication and exchange ties with over 60 universities and research institutes in the world. Reciprocal credit transferable programs and various joint-education programs have been conducted with over 20 overseas universities and the universities in Taiwan. Long term collaborative research programs have been completed or are being conducted with more than 10 international organizations. The First Military University located at the foot of the picturesque Baiyun mountains in Guangzhou, together with it’s school in the suburbs covers an area of nearly 1 Million sq.mt. 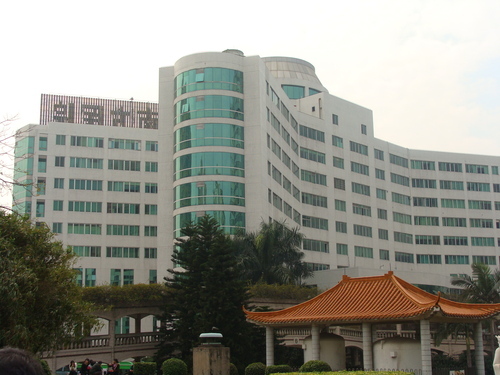 The University has 2 affiliated hospitals – Nanfung Hospital & Zhujiang Hospital, holding over 2500 hospital beds. Since 8th Five Year Plans the college has developed 300 new techniques in procedures such as diagnosis & treatment with endoscopy, diagnosis & treatment with cardiovascular intervention, hematodialysis etc. The Nanfung Hospital founded during China’s War of Liberation is a comprehensive, modernised hospital with sophisticated equipment, latest techniques, beautiful surroundings and quality service. More than 300 specialists & professors work in the 50 departments under it’s administartion. The University possesses abundant teaching faculties. At present working on campus are 11,000 staff of which 700 are professors & associate professors and more than 80 supervisors of doctoral candidates. More than 100 experts in the university hold the standing membership in the military or national institutions and 4 in International academic institutions. The First Military University attaches strong importance to the integration of Science, Engineering and Medicine. The book centre of the college has a compilation of 1 million volumes as well as 2,300 Chinese and Foreign periodicals. In the 8th five Year project the university has undertaken more than 400 key projects for the World Health Organisation. It has close ties with many premier institutions of US, Britain, Japan, France, Australia and there are students from 10 countries studying in the university. Students who have completed secondary education, aged 18-45, in good health and willing to abide by the laws and decrees of China and the regulations of the university.